Are we just going to ignore this button that appeared in the Beta tab? I tried it and it emptied my library, can't do anything. Currently attempting a rollback to 1.16. Holy cow, are you serious? That makes sense with the word 'demo', if it means for a full software demo; but if it is true then they should do an emergency hotfix to remove it. Yep. I'm stuck with a screenshot from The Climb on my desktop and I can't see any of my games nor install anything either. Please DO NOT press the "Start a Demo" button. It's not working and shouldn't be there. Thanks. Rolling back to 1.16 fixed the empty library. Updating back to 1.17 now and staying far away from that button. Thanks for rolling out that hotfix! Also, how can I see my Steam VR games from the Library? I'm not sure the release notes are integrated yet. 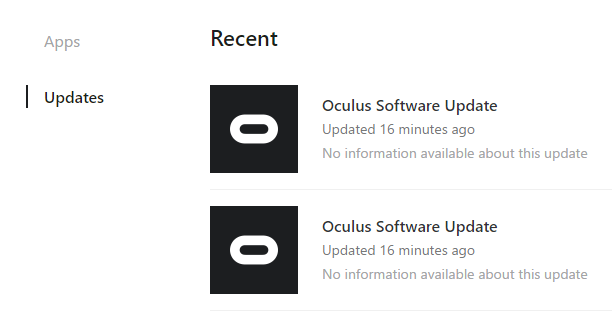 For 3rd party games, just launch them from outside Oculus and click OK when it asks you to add them. Does this mean we can launch Steam games from within Oculus Home after we added them by just one button click? That's just awesome! yep this is great news and i must be psychic as it was one of my moans on missing features that i posted a couple of days ago. If you launch a steam game from oculus home, it will start steam / steam vr? 1 thing i DONT like... the drop down option for uninstalled games is now gone, its instead part of a filter for your entire library... which is a step back imo. 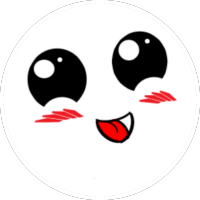 now i have added my steam games i will have probably 60 installed titles in my home library. 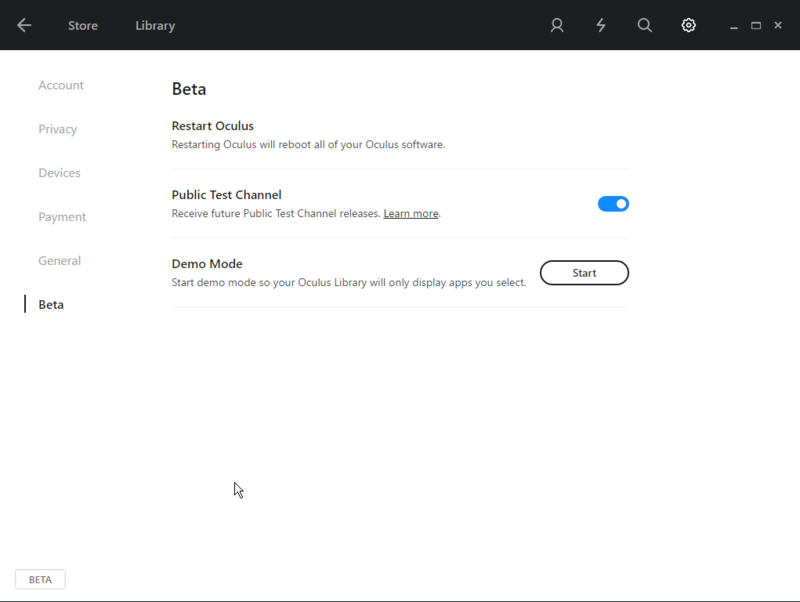 having uninstalled as an entirely separate list is better imo as they stand out more..
"You can now see detailed release notes for recent app updates, including the Oculus system software, from the Updates screen in Library." Finally! I hate seeing "game updated" but can't read the patch notes. Yes; but it's way quicker as it launches STEAMVR in the background (assuming you already have STEAM started). Thus it feels like going from Home and directly to your STEAMVR game. I don't know - I kind of like the new look. It's still has the right click uninstall and now you have a filter to hide the games you did uninstall. It's a nice little feature for monitoring what I had in the past and what the kids downloaded and uninstall as well. Oh nvm I see what you mean now - agree I think having it as another list would be a good thing as well. Something you can toggle between uninstall and install games would be a good thing to have. One thing I like to maybe add to a future update is the ability to reset in game settings from the Oculus Store as a menu option so if a game is stuck or needs to be fix - it can be from the Oculus Store before starting it in VR. This is stupid. Why can it not be undone? I added Rez infinite and for some reason it added 2 icons. So I removed one. And the other icon wouldn't work, so I removed that one to try to readd it and now it won't let me readd it? The fact that it can't be undone is really stupid. What is the point of having it in the first place? I know I am coming off as bitter. I mean, I'm truly not, love that you added this feature, but just super annoyed atm that it can't be undone when it makes no logical sense. I never noticed any issue with the horizon or any horizontal slant before, until the latest 1.17. Specifically I'm on 1.17.0.424527 beta. I've calibrated the sensors, and guardian system a number of times, and right now I can see a very slight horizontal slant, where any horizontal straight lines e.g. in Oculus Home, slant every so slightly to the left and down. I don't believe it's intentional and hopefully the feature can be completed in the future. Thanks. new update? demo mode has returned? had a driver update with the update as well! Is it safe to try Demo Mode this time around..? Haha.